Contaminated Sediments – How Do We Strike the Proper Balance? Excerpt from: Contaminated Sediments – How Do We Strike the Proper Balance? By: Richard Fox, Vice President/Principal Scientist, Natural Resource Technology, Inc.
A high degree of uncertainty as to how contaminants move through the food chain. USEPA and state environmental agencies (Agencies) are increasingly focused on reducing potential risk through remediating contaminated sediment sites around the country. Large programs such as USEPA Great Lakes National Program Office’s (GLNPO) Great Lakes Legacy Act (GLLA) are dedicated to addressing contaminated sediments. Although the GLLA is focused on specific sites in the Great Lakes, the issue of contaminated sediments is nationwide. Many larger sites have been remediated or are currently being remediated (e.g., Lower Fox River (WI), Hudson River (NY), Duwamish River (WA)). For others a Record of Decision (ROD) prescribing the site remedy has been or will soon be issued through USEPA’s Superfund Program (e.g., Passaic River (NJ), Lower Willamette (OR), Gowanus Canal (NY)). Action 5: Pursuit of sediment remediation projects as a public-private collaborative enterprise. All five actions are important and if implemented will very likely realize accelerated sediment cleanups. Though all of these actions can accelerate site cleanups, Actions 3-5 will likely not occur without Actions 1 and 2. This article focuses on the first two of the five recommended actions. Why do we get stuck? The Agencies are trying to reduce risk – risk to human health and the environment. However, Agencies often select remedies that may not be the best remedy to reduce risk. Industries or responsible parties (RPs) are usually forced to remediate their site and seek to do it at the least cost. At most contaminated sediment sites, Agencies prefer dredging to remove contaminants, while RPs prefer monitored natural recovery (MNR), adding amendments to reduce bioavailability, or capping. They are typically at odds. The GLLA Program has not experienced the delays that typically plague other sediment remediation sites. GLLA has completed remediation at 14 sediment sites and has many others at various stages moving toward remediation. However, the GLLA is limited to specific areas in the Great Lakes and is not available across the country. How do we accomplish sediment remediation in a timely manner for sites not in the GLLA? 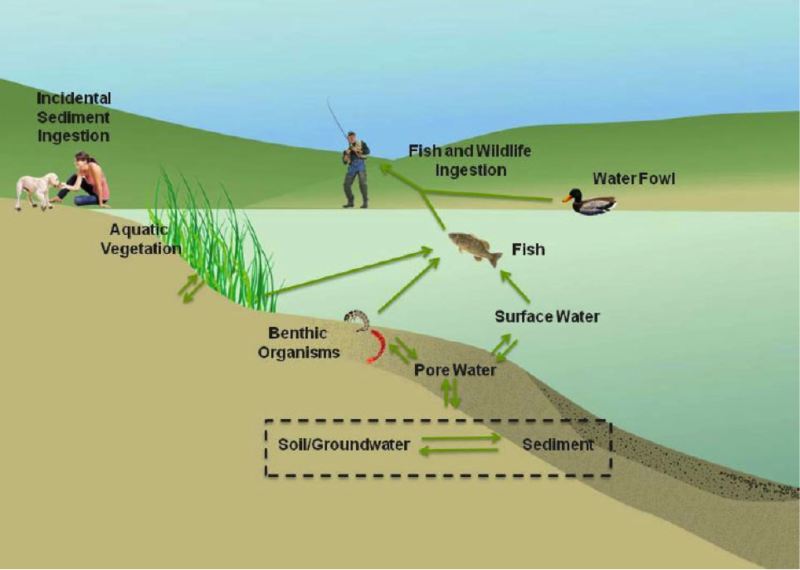 Is GLLA a model for future sediment remediation projects? Many practitioners believe the GLLA model should be applied at locations outside the Great Lakes. However, in the current political climate it is unlikely a broader cost-sharing program will be created. Clearly, we have learned from the GLLA Program that projects move to remediation faster and achieve better results when interests are aligned. Typically, sites are remediated using dredging or removal, capping, adding amendments to in situ sediments to reduce bioavailability (more recently), MNR, or a combination of these. There are advantages and limitations to each of these technologies. The table below provides a high-level comparison of the advantages and limitations to these technologies. Based on this, implementing Actions 1 and 2 (i.e., site vision along with clear, meaningful communication with stakeholders; Bridges et al., 2011) are important first steps to create alignment between Agencies and RPS. These actions are more effective if done early in the process before risk-based remedy decisions are made and dollars are spent. Action 1 offered by Bridges et al. (2011) recommends, “development of a detailed and explicit project vision and accompanying objective, achievable short-term goals and long-term goals, and metrics of remedy success at the outset of a project, with refinement occurring as needed throughout the duration of the project,” as the first of five actions for accelerating cleanups at contaminated sediment sites. Site vision can be viewed as taking the current CSM to the future CSM. Developing a vision upfront is critical because different remedial technologies for contaminated sediments can enhance or limit future site use. An RP that has started along the process of performing the remedial investigation (RI), feasibility study (FS), remedial design, and remedial action without a vision usually only asks, “How can we minimize the cost of the remedy?” A much better question is, “How can we use ‘smart from the start’ to create a win for us and a win for the Agencies?” If the site vision is aligned early in the process, a win-win situation is more attainable. Being “smart from the start” (where we consider the end game, understand the Agencies’ and RP’s perspectives, and find alignment) is the opportunity to balance risk reduction achieved and cost (i.e., risk management). This is only achieved when there is a common understanding, respect between parties, and a true effort to attain shared goals. “Smart from the start” is as much psychological as technical. Part of the site vision is the need for a high-level understanding of potential remedy costs relative to risk reduction. This is done by estimating the areas and volumes of contaminated sediments to a variety of potential cleanup concentrations or levels (CULs). These estimated volumes can help establish general cost ranges along with the potential risk reduction to provide an overall perspective of sensitivities to changes in the program. It is also important to understand the feasibility of remedial technologies at a site. Dredging is difficult under certain conditions (e.g., if contaminated sediments overlie a rocky substrate). Capping is difficult under other conditions (e.g., if there are navigation concerns or the potential for ice scour of the cap). Experienced personnel are best to assist with these analyses, especially if there are significant data gaps in understanding the breadth of contamination and potential risk. It is critical to engage Agency personnel and demonstrate a willingness to work with them. The goal is to create mutual trust which thereby, allows for more open and meaningful dialog. Trust allows for discussion of ideas that might otherwise be thrown out without due consideration. It is ideal to engage Agency personnel around a vision for the site. Site vision is becoming increasingly more important and will likely be more of a driver for compelling Agencies to take action on sites. Further, consideration of site vision will become increasingly more important and represents a prime opportunity to engage the Agency personnel to build relationships. Attaining agreement on the site vision may be the most significant impediment to executing a contaminated sediment project that meets the goals of both the Agencies and RPs. Site vision discussions should include potential for leveraging activities in the area that are being conducted or are planned to be conducted. This is a time to establish a cooperative relationship, and hopefully a partnership. It is important to keep early discussions at a high level to avoid forcing one’s agenda. There is a tendency in early negotiations and discussions to try to push for less expensive remedial technologies. This should be resisted. There is much more to be gained when an RP makes every attempt to understand, agree to, and then blend the vision of the Agencies into a remedial approach. The Great Lake Commission has recognized the value of developing a site vision and recently held a workshop titled “Creating Vibrant Coastal Communities: Techniques, Tools, and Resources to Advanced Placemaking in Waterfront Areas” was recently held in Muskegon, Michigan. This workshop focused on an integrated approach to waterfront redevelopment that includes sediment remediation. Why are relationships so important? When perspectives are exchanged in a trust-filled environment, there is more consideration of ideas before taking positions on issues. This is because in a trusting environment motives are rarely questioned. Conversely, (and unfortunately, typically) motives behind ideas are questioned when there is distrust. Relationship building provides the opportunity to change the basis of understanding. While there is rarely agreement on all issues, merely modifying ones views to consider the perspective of the others will help bridge that gap. Environmental negotiations, in particular those specifically related to contaminated sediment sites, are locked in on the “mythical fixed pie” (Bazeman, 2003). The negotiation paradigm of the “mythical fixed pie” is that the “pie” is finite and in order for one party to gain more, the other party must give something up. Recall that at most contaminated sediment sites the Agencies prefer dredging to remove contaminants, while RPs prefer MNR, adding amendments, or capping. The mythical fixed pie is capping (or MNR or adding amendments) versus dredging; remove contaminants at a high cost or leave them in place at a lower cost. If Agency personnel allow MNR, adding amendments, or capping they are losing some of the pie. If the RPs are not allowed MNR, adding amendments, or capping they are losing pie. Such negotiations are based on win-lose rather than win-win. There are opportunities to expand the pie and create win-win scenarios. As mentioned above, trust between Agencies and RPs is the first step to expanding the pie and for achieving the win-win. The second step is to agree to or at least understand the Agencies’ site vision. Remedial options can then be discussed based on the site visions rather than on cost alone. When there is trust and a site vision, the pie is not fixed and win-win can be attained. As an example, proposing to install caps versus dredging will be better received by Agency personnel if both trust and a site vision (e.g., where shallowing or enhancement to natural habitat is desired) are present. Conversely, when capping is proposed without a site vision that supports the benefits of capping, Agency personnel usually feel that the RPs are merely trying to propose a less expensive remedy that leaves contamination in place. Another way to gain trust is to propose remedy components that are desired by the other party. When dredging is proposed by RPs, Agency personnel are more likely to trust that RPs are not just seeking the lowest cost remedy. Dredging can strategically be used to target areas of highest contamination or to remove sediments that inhibit navigation. The overall goal of risk management is to reduce risk to acceptable levels at the least cost. Of course the goal is to also limit the overall liability. Liability includes the cost of the assessment, remediation, monitoring the effectiveness of the remedy, and potentially maintaining the remedy if contamination is left behind untreated (i.e., tailing liability). It is critical to understand that many contaminated sediment remedies have tailing liability that lasts beyond completion of the project remedy. Under Superfund, one could argue all remedies have tailing liability because of the need to monitor the effectiveness of the remedy. However, if sediments are capped in place, amended with organic carbon to reduce bioavailability, or subject to MNR, tailing liability can be far more significant. The conundrum is that less expensive remedies typically come with more tailing liability. It is classic “pay me now or pay me later.” Further, the larger the site the more difficult and expensive it is to remove or treat all contamination, as river dynamics tend to redistribute contamination over larger areas. With consideration to overall liability, combination remedies (i.e., use of multiple technologies) often afford the greatest opportunity to expand the pie and create “win-win” scenarios. Combination remedies, by their nature, balance the tensions between parties because they allow both parties to attain wins. An example combination remedy is being constructed on the Lower Fox River in Wisconsin. The remedial action level is 1 ppm. There are approximately 7.25 million cubic yards of sediments that must be remediated. Approximately 70% of the mass of PCBs will be removed from the river using hydraulic dredging. The rest of the sediments (approximately 3.25 million cubic yards) will be capped or covered with sand. This remedy strikes a balance between the Agencies’ preferences for removal of PCBs with the RPs preferences for lower cost. The combination remedy was arrived at through many meetings between the RPs and the Agencies and their Oversight Team. The meetings focused on the site vision and risk reduction. These meetings were conducted while there was a ROD in place that called for dredging all sediments but allowed for a “contingent remedy” of capping if capping could be shown to be as effective as and less expensive than dredging. The combination remedy required an Amended ROD. The fact that the Agencies were willing to amend the ROD shows the success of the processes of visioning the site and creating trust through meaningful and open dialog between the parties. This truly was a win-win. Finally, there have been a few projects recently where the RPs have opted for dredging all contaminated sediment out in order to create a situation with no tailing liability. These projects have been conducted under a removal action and later receive a “No Action” decision in the ROD. These types of projects are easier to come up with a win-win but the greatest opportunities exist when the project is conceived of from the beginning. A balance must be struck to ensure that the remedy is complete enough for the Agency to agree to a situation where the remediation is complete. This requires openness and trust. The final piece to all of this is to align the site vision, remedy selection, and tailing liability with overall risk reduction. If communication has led to trust, it is possible to agree to a win-win remedy where both parties are satisfied. Bridges, T.S., S.C. Nadeau, and M.C. McCulloch. 2011. “Accelerating Progress at Contaminated Sediment Sites: Moving from Guidance to Practice”. Integrated Environmental Assessment and Management; Volume 8, Number 2: pp. 331-338. Bazeman, M.X. “Mythical Fixed Pie”. Harvard Business Publishing Newsletters; 3 pages. November 1, 2003. Prod. #: N0311A-PDF-ENG.